This Norlys Stockholm Grande outdoor pedestal lantern in galvanised finish with Art Deco style and rated IP54 boasts a cylinder shade and protective bars. Featuring a circular floor mount, short post and large lantern, with wide brimmed roof, clear polycarbonate cylinder shade and protective bands that create a wonderful lighting effect. If you are searching for quality outdoor lighting to complement your 1920’s or contemporary home, this hot dip galvanised steel gate post lantern should be considered. It looks fantastic outside any home to illuminate the garden or pathway and welcome your visitors after dark. A lovely Art Deco outside light that oozes quality and character, manufactured by Norlys, a Norwegian manufacturer who offer an unrivalled 15 year structural guarantee. They recommend oil be applied to the fitting from time to time to ensure the long term beauty of the fixture. The warranty lasts from purchase to within 15 years of normal use and covers deterioration resulting in structural failure. There may be signs of aging, corrosion or paint fading, but the integrity of the construction of these fittings means they will not be rendered unusable within a lifetime of 15 years. This is a Class II double-insulated exterior pedestal lantern that must not be earthed and can be safely used on older properties without an earth circuit. There are matching fittings in the Stockholm galvanised finish Art Deco lighting range, please see below and also available in black. 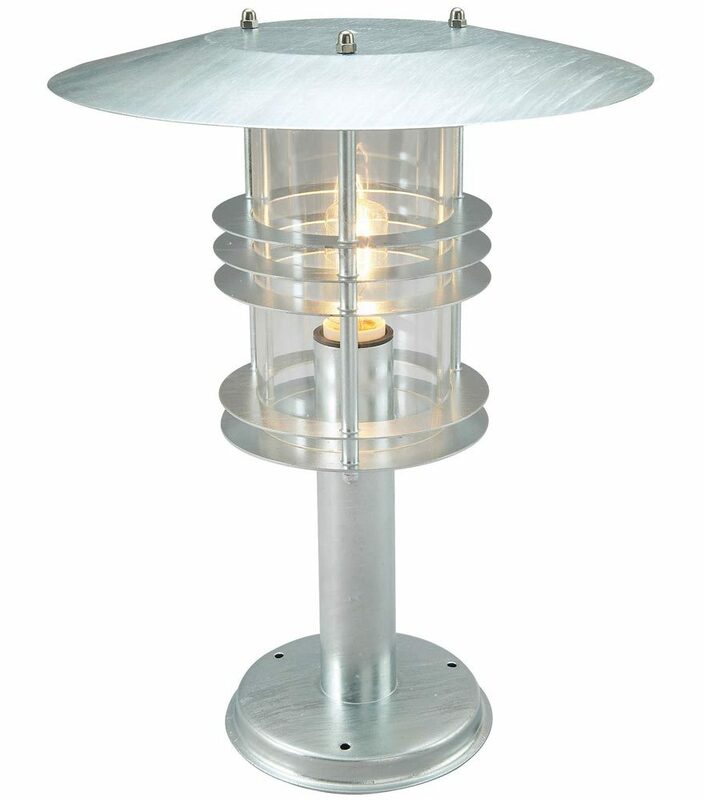 This exterior light is supplied by Elstead Lighting and manufactured by Norlys, a Scandinavian company with 50 years experience in the design and manufacture of exterior lighting designed to withstand tough climatic conditions, such as the Stockholm Grande outdoor pedestal lantern in galvanised finish with Art Deco style and rated IP54 you see here.